Are you ready to chase away the winter blues and shake your maracas? 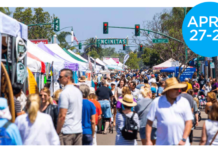 You are warmly invited to the 40th Anniversary Celebration of Fiesta del Sol in Solana Beach on May 18 and May 19 from 9 a.m. to 9 p.m. each day. The Fiesta del Sol is presented by the Solana Beach Chamber of Commerce in collaboration with the City of Solana Beach and The Belly Up. It is the largest community-focused, alcohol and tobacco free event in San Diego County and guarantees two full days of family-friendly fun. The festival aims to encourage positive change by bringing communities together and offers rare marketing opportunities for local small businesses, nonprofits, and corporate partners. The Belly Up Tavern is a popular music venue and a central part of San Diego history. A local favorite, this venue offers the best in new and established artists. Genres range from rock, reggae, and hip-hop to blues, Latin, folk, and jazz. And to keep those summer vibes going, the Belly Up has once again partnered with the Solana Beach Chamber of Commerce to provide continuous live music at this year’s Fiesta del Sol. The lineup includes music spanning cultures from Africa to South America to the U.S.A.
For those who need a dose of retail therapy, Cedros Design District has unique boutique stores, art galleries, vintage shops, personalized wineries, breweries, and inimitable eateries. And just like last year, Fiesta del Sol has included the shopping district in the festivities—they will be celebrating on their street with bands and shopping specials during the weekend. Feeling more like a relaxing picnic next to the beach? Fletcher Cove Beach Park offers a peaceful space for family and friends to bond and socialize. It is also where Fiesta del Sol will celebrate its 40th birthday. And if you have missed out on the last 39, don’t worry too much because 2019’s celebration is shaping up to be legendary. In 1979, the first Fiesta del Sol attracted only 2,500 people and consisted of a few kegs, beach games, and the crowning of Mr. And Mrs. Solana Beach. This year, the festival is expected to attract around 50,000 summer- loving attendees! 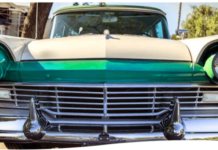 It won’t just be endless rows of information tables; the event includes specialty food vendors and San Diego- area food trucks—kitchens on wheels that conveniently chauffer unique eats to you. Choose from more than 20 food providers, such as Delicioso; Matheny’s Wagon Works for some juicy bratwurst; Mangia Mangia Mobile Catering, which offers gourmet Italian cuisine; Born In Brooklyn; Italian ice specialist Mustache Mikes; and the one and only Solana Beach Fireman’s Pancake Breakfast on May 19 from 7:30 a.m. until 10:30 a.m. If you feel like indulging the beer enthusiast or sommelier in you while enjoying spectacular views of the stage, make your way to the adults-only wine or beer garden. The wine garden helps support the Del Sol Lion’s fundraising campaigns each year, so now you can drink wine for a good cause. And we haven’t forgotten about the little ones. The Fiesta del Sol features a children’s entertainment area with kid-friendly food options, exciting rides, games, and activities. Some favorites include the rides Swing!” and “Dragon,” the inflatable bounce house and slide, face painting—for those who want to turn into their favorite character—and a climbing wall for the energetic acrobats. The area also features an arts and crafts section where little artists can create original masterpieces to their heart’s content. Head to the main stage each day between 9 a.m. and 1 p.m. to support acts from local schools, dance and performance companies, martial arts schools, and up-and-coming bands. This is the perfect chance for them to showcase their many talents, and support from fellow community members can give them a much- needed boost in confidence. Did we mention admission is free? So is parking, and a free shuttle service is always available. Don’t feel like driving? You can take the bus, Amtrak train, or Coaster— they’ll drop you off right across the street from the Fiesta del Sol main entrance. And if you want to stay a night or two, Winner’s Circle Resort, Holiday Inn Express and Suites, and the Courtyard Marriott in Solana Beach offer special rates throughout the event. 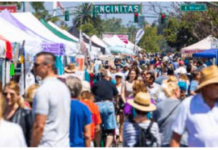 A family-friendly celebration of this magnitude is what the San Diego community is all about: cultural understanding, giving back to the community, supporting small businesses, delectable food, music for the soul, and fiesta!